The use of unmanned aerial vehicles (UAVs), colloquially referred to as ‘drones’, for biological field research is increasing [1, 2, 3]. Small, civilian UAVs are providing a viable, economical tool for ecology researchers and environmental managers. UAVs are particularly useful for wildlife observation and monitoring as they can produce systematic data of high spatial and temporal resolution . However, this new technology could also have undesirable and unforeseen impacts on wildlife, the risks of which we currently have little understanding [5, 6, 7]. There is a need for a code of best practice in the use of UAVs to mitigate or alleviate these risks, which we begin to develop here. Different wildlife populations can respond idiosyncratically to a UAV in proximity depending on a variety of factors, including the species, environmental and historical context, as well as the type of UAV and its method of operation. While we do not presently have sufficient information on how these factors might affect wildlife to develop prescriptive policies for UAV use, we could draw from existing guidelines for ensuring the ethical treatment of animals in research [8, 9]. For example, the ARRIVE (Animals in Research: Reporting In Vivo Experiments) guidelines detail the minimum information all scientific publications reporting research using laboratory animals should include , which may serve as a good starting point for the UAV context. Considering the growing popularity of UAVs as a tool among field biologists, we advocate for the precautionary principle to manage these risks. Specifically, we provide a suite of recommendations as the basis for a code of best practice in the use of UAVs in the vicinity of animals or for the purpose of animal research, which supplement current standards in animal field research and reporting. Adopt the precautionary principle in lieu of evidence. When researchers cannot make informed decisions about minimum wildlife disturbance flight practices for their environment or study species, they should exercise caution, particularly if endangered species or ecologically sensitive habitats are involved. While reported observations of animal responses to UAVs are increasing, there is a need for more empirical evidence across a range of animals and environments. Experiments that ethically quantify disturbance using captive and wild animals to fill this knowledge gap are necessary to inform minimum wildlife disturbance practices. As an interim measure, expert advice on species and UAV monitoring should be obtained for operations involving taxa whose responses to UAVs are poorly quantified or unknown. Utilise the institutional animal ethics process to provide oversight to UAV-derived animal observations and experiments. UAV monitoring that involves animals will benefit from ensuring all UAV methods are in accordance with approved institutional ethics permits. We encourage UAV users to seek this approval when appropriate and explain the anticipated benefit of using UAV technology in their situation. Ethics committees should evaluate these claims relative to comparative traditional techniques (e.g. ground surveys or remotely sensed data from an alternative, higher altitude platform such as manned aircraft or satellites). Adhere to relevant civil aviation rules and adopt equipment maintenance and operator training schedules. UAV operations need to comply with all relevant civil aviation rules which may include restrictions on flying beyond visual line of sight, above a defined altitude, at night and near people or in the vicinity of important infrastructure and prohibited areas. In countries where rules are not present or are still evolving, operators are encouraged to exercise caution. UAV equipment should be regularly serviced to ensure good working order, and maintenance recorded appropriately. Experienced operators should be utilised for UAV operations (formal accreditation is necessary in some countries). Where appropriate, approval for flight should be sought from indigenous communities. Select appropriate UAV and sensor equipment. UAVs should be selected to minimise visual and audio stimulus to target and non-target organisms, while remaining capable of satisfying study objectives. Consideration should be given to the way different units move (e.g. the gliding motion of a fixed-wing unit) as well as their shape, volume and colour relative to the study environment. In some cases, it may be beneficial to modify UAVs to mimic non-threatening wildlife, e.g. a bird that is not a predator of the target species. Sensors should be optimised (e.g. focal length) to enable collection of suitable data from a UAV operated, typically, as high or as far as possible from the subjects. Exercise minimum wildlife disturbance flight practices. Particular attention should be given to siting launch and recovery sites away from animals (out of sight if possible) and maintaining a reasonable distance from animals at all times during flight. Potentially threatening approach trajectories and sporadic flight movements should be avoided. Species-specific protocols, including optimum flight altitude, should be developed and implemented wherever possible. Cease UAV operations if they are excessively disruptive. Animal responses should be measured during UAV operations (and before and after if possible). Monitoring stress response at a physiological level is encouraged, as is the use of tracking technology to quantify potential displacement. Operations should be aborted if excessive disturbance results, especially in cases when quantification of UAV disturbance is not a research interest. The methods for such studies should be reviewed and only resumed with a refined protocol if justifiable. Detailed, accurate reporting of methods and results in publications. UAV specifications and flight practices should be reported accurately and in full. Thorough results should be reported to ensure findings can be integrated in future research. Notes of animal responses (see above) should be included in published studies to generate an evidence base for refined guidelines. We encourage authors to be proactive in sharing suggestions for improving UAV best practices in biological field research and also to guide the regulation of recreational use. Importantly, such reports should include both positive and negative observations, including accidents during operations and incidents of excessive disturbances to animals. Publishers may wish to consider minimum reporting requirements for manuscripts that involve UAV operations. 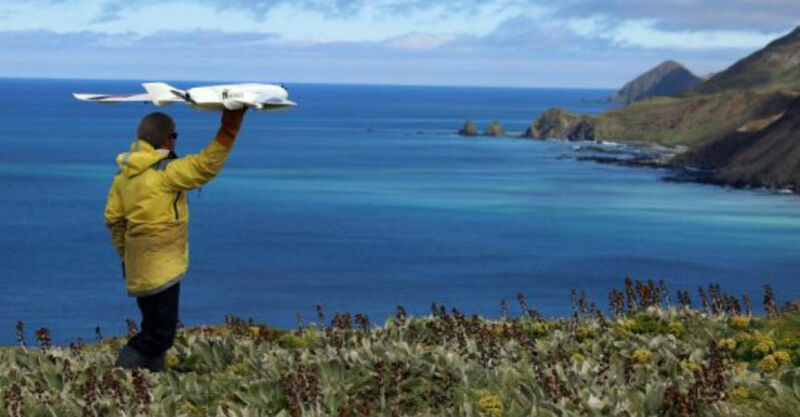 Promoting the awareness, development and uptake of a code of best practice in the use of UAVs will improve their suitability as a low impact ecological survey tool. We consider this code to be a first and guiding step in the development of species-specific protocols that mitigate or alleviate potential UAV disturbance to wildlife. J.C.H. and L.P.K. conceived and wrote the paper. Chabot, D. and Bird, D.M. Wildlife research and management methods in the 21st century: Where do unmanned aircraft fit in?1. Watts, A.C., Perry, J.H., Smith, S.E., Burgess, M.A., Wilkinson, B.E., Szantoi, Z., Ifju, P.G., and Percival, H.F.	Small unmanned aircraft systems for low-altitude aerial surveys. Anderson, K. and Gaston, K.J. Lightweight unmanned aerial vehicles will revolutionize spatial ecology. Linchant, J., Lisein, J., Semeki, J., Lejeune, P., and Vermeulen, C.	Are unmanned aircraft systems (UASs) the future of wildlife monitoring? A review of accomplishments and challenges. Vas, E., Lescroel, A., Duriez, O., Boguszewski, G., and Gremillet, D.	Approaching birds with drones: first experiments and ethical guidelines. Ditmer, M.A., Vincent, J.B., Werden, L.K., Tanner, J.C., Laske, T.G., Iaizzo, P.A., Garshelis, D.L., and Fieberg, J.R.	Bears show a physiological but limited behavioral response to unmanned aerial vehicles. Pomeroy, P., O’Connor, L., and Davies, P.	Assessing use of and reaction to unmanned aerial systems in gray and harbor seals during breeding and molt in the UK1. Sikes, R.S., Gannon, W.L., and Mammalogists, A.S. Guidelines of the American Society of Mammalogists for the use of wild mammals in research. National Health and Medical Research Council. Australian code for the care and use of animals for scientific purposes. Kilkenny, C., Browne, W.J., Cuthill, I.C., Emerson, M., and Altman, D.G. Improving bioscience research reporting: the ARRIVE guidelines for reporting animal research. ← A guide to using drones to study wildlife: first, do no harm!